Looking for an ideal place to host a yoga retreat, corporate wellness weekend, girls gathering, or other event? 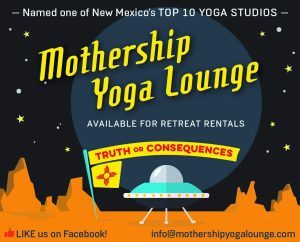 The Mothership Yoga Lounge & Hot Springs could be your spot. Fly into Albuquerque or El Paso and it’s an easy drive to Truth or Consequences. Once you arrive, everything is within walking distance including the yoga studio, hot springs, restaurants, coffee shops, art galleries, and nature walks along the Rio Grande. Our beautiful, 1,600 square-foot studio is available for rent. Formerly an adobe church from the 1930’s, the original oak floors have been restored and the room is spacious and infused with positive vibes. The studio is ideal for yoga, meditation, dance and other healing arts. Rental includes private use of the studio (nobody else will be in or out during your retreat), a bathroom, plus props including yoga mats, blankets, blocks and straps. The studio fits up to 36 mats comfortably. We would be happy to recommend places for people to stay that include soaking in the hot springs and are all within a short walking distance to the Mothership. We can also provide restaurant recommendations. If you’d like, we can list your event on our Facebook events page and include information about your retreat in our Mothership newsletter. Want us to take care of the logistics for your retreat, including lodging, catered group meals at the Mothership, plus activities that could include group soaks in our large, crystal waterfall tub, all-levels yoga classes designed to help people feel more open and relaxed, light hiking, intention-setting, ping pong, fire pits and more. This option includes full use of the Mothership building. In addition to the studio, there is a large kitchen and eating area, cozy couches by the fire, and an outdoor deck with a sitting area, BBQ and a private soaking tub. We would be happy to work with you to specially tailor each event to meet your needs.